Natural and Nourishing Sunscreen with no harmful ingredients, hand-crafted, and it really works! 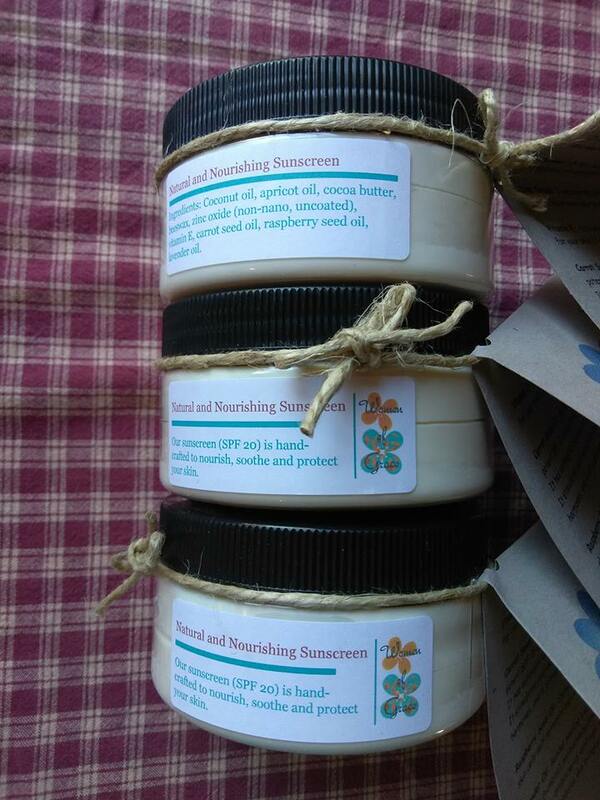 Natural and Nourishing Sunscreen: Please note, this price does not include shipping for if you want to pick it up at our home or church, or if you're ordering more than one. If you want it shipped, click the link below for our shipping option. Our high-quality natural ingredients protect your skin, nourish it, and even aid skin healing and slow signs of skin aging. It contains lovely ingredients such as cocoa butter, coconut oil, raspberry seed oil, carrot seed oil, vitamin E, lavender, zinc oxide, and apricot oil. It's waterproof and provides broad spectrum sun protection from both UVA and UVB rays. The SPF depends how thickly you apply it. It smells fabulous, but has no artificial fragrance. It also makes a great after-sun treatment, since the ingredients promote healing and are soothing. Please note: It is important that you know your own skin, what your sensitivities are and your reactions. Test our sunscreen (how thickly you apply it and how long you can remain in the sun) first with a limited-exposure opportunity and adjust accordingly. Because I have fair skin, I must apply a fairly thick layer if I’m going to be in the sun for any length of time. For short times in the sun, I only need a thin layer. Most of my children tan easily and only need a thin layer, even if they’re in the sun all day. Like any sunscreen, reapply after swimming or heavy sweating. Available in 8 oz jars. Coconut oil: Coconut oil can be used alone as a low-SPF sunscreen. It’s antibacterial and full of antioxidants which help counter oxidative damage (which causes cancer). Apricot oil: Full of Vitamins A, D, and E! As such, it contains anti-aging properties as well! Very nice for conditioning your skin. Cocoa butter: Contains anti-inflammatory properties and contains many good vitamins for your skin. It smells lovely! It’s an antioxidant powerhouse! 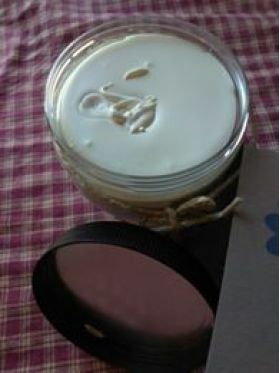 It contains anti-aging properties, can serve as scar reducer, and can be used as a deep moisturizer. And it helps provide some waterproofing. Beeswax: Primary source of waterproofing, but it has antioxidant, antibacterial, and anti-inflammatory properties as well! Zinc Oxide: We use non-nano, uncoated particle zinc to prevent over-absorption. Zinc oxide provides broad-spectrum protection against both UVA and UVB rays. Research shows it has many other amazing qualities including providing protection against basal cell carcinoma, improving wound healing and preventing bacterial infections, aiding in recovery of burns and damaged tissue, helping to treat acne breakouts, preventing aging of the skin, improving synthesis of collagen and forming of new connective tissue! Quite a powerhouse! Vitamin E: Antioxidant and anti-inflammatory properties make it really good for your skin! It also will help to preserve the shelf-life of your product. Carrot Seed Oil: Look for carrot seed oil made from Queen Anne’s Lace (daucus carota) for a more potent SPF. It supports production of natural (tanning) in your skin. It has antiseptic and antiviral properties. It also aids in detoxing your skin! It stimulates your metabolism, aids in balancing hormones, and is anti-carcinogenic! Raspberry Seed Oil: Studies show that this lovely oil can make abnormal skin cells self-terminate! Lavender Oil: Besides smelling lovely, it has so many amazing properties! It’s analgesic (numbing), antihistamine (limiting allergic reaction), ant-inflammatory, antibacterial, antifungal, antioxidant, anti-aging, and anti-carcinogenic. It reduces skin irritation and promotes healing.